The US. 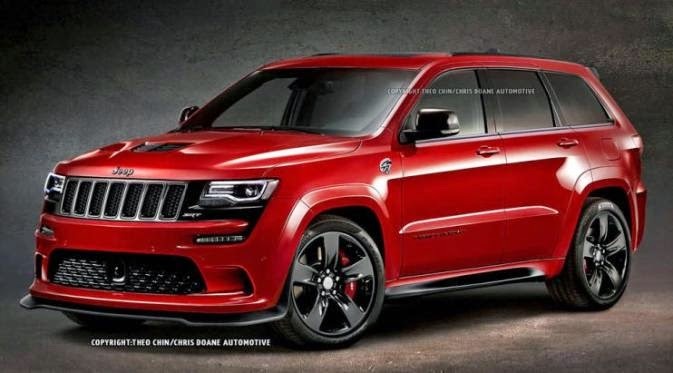 renowned SUV manufacturers, Jeep had announced plans to create the Grand Cherokee SRT is claimed as their fastest SUV. Well, some time ago the figure of the fastest Jeep SUV's began to show themselves in cyberspace. The Grand Cherokee has a performance that is so cruel because it uses the same engine with the belonging of Dodge Challenger SRT muscle car. 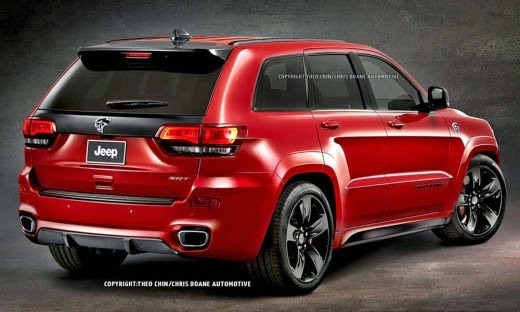 Through photo leaked by Theophilus Chin as reported from Inautonews, on Wednesday, December 17, 2014, appearance on the Grand Cherokee comes with a sporty design and muscular. The exterior appearance of the face, a lot has changed thanks to the large bumper with body kit. To adjust the shape of the bumper are changing, Jeep also added side skirts along the side of the car so as to make the display becomes more flat. To accommodate the engine power which is increased sharply, the Grand Cherokee SRT Hellcat using 20-inch rims with black metallic. Of course, the biggest change made by Jeep to the components behind the front hood of the Grand Cherokee. This SUV is equipped with a 6.2 liter V8 engine with the HEMI features that adopted from the Dodge.